At this Jewish wedding held at the Fairmont Hotel in Dallas, TX, the father of the bride leans in and whispers in the bride's ear during the Ketubah signing. 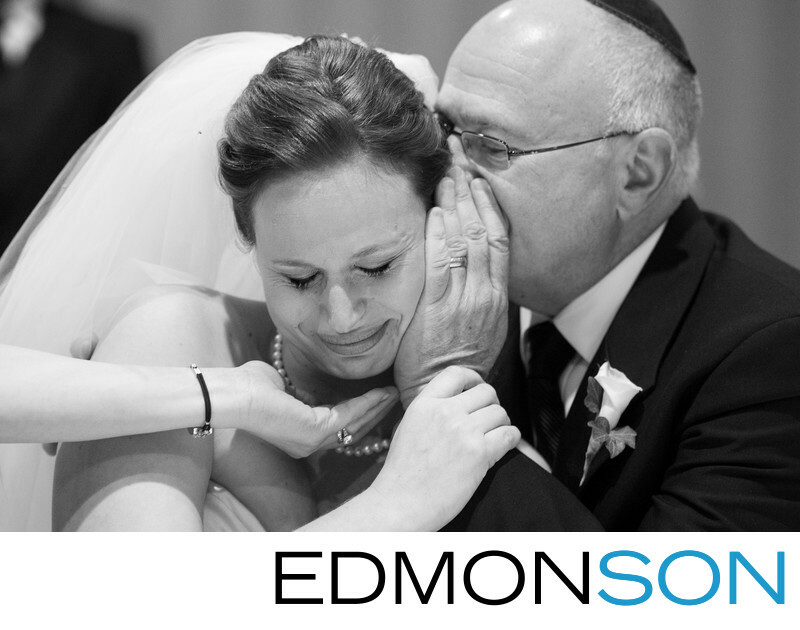 We love wedding photojournalism and Jewish wedding celebrations are full of incredibly tender moments throughout the day. The emotional impact of this moment is accentuated through the black and white presentation that provides a sense of humanity. As her dad holds his hand to hear ear, the hand of her relative is cupping her chin and catching her tears. The bride's expression on her face and tender grasping of his wrist show how connected she is with her parents and family. Technically, this photograph is a difficult one to capture as the room used for the ketubah signing had no window light. Regardless of the lighting conditions, the impact of this photo is felt through the tremendous expressions and energy shown. The wedding coordinators were DFW Events. The Fairmont Hotel in downtown Dallas is a popular venue for traditional & Orthodox Jewish weddings in DFW because it is one of the few in the metroplex with kosher certification. It is located in the Dallas Arts District close to the Dallas Musem of Art and Nasher Sculpture Gardens. The address for the hotel is 1717 N Akard St, Dallas, TX 75201 which makes it a convenient location for your ceremony and reception. 1/80; f/2.8; ISO 4000; 122.0 mm.